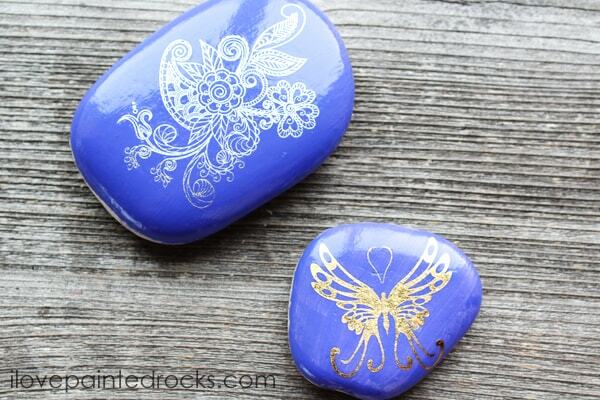 If you are new to painting rocks, it is easy to feel intimidated by all the beautiful painted rocks people in online rock groups are making. The good news is that you can totally fake artistic ability with temporary tattoos! That's right! 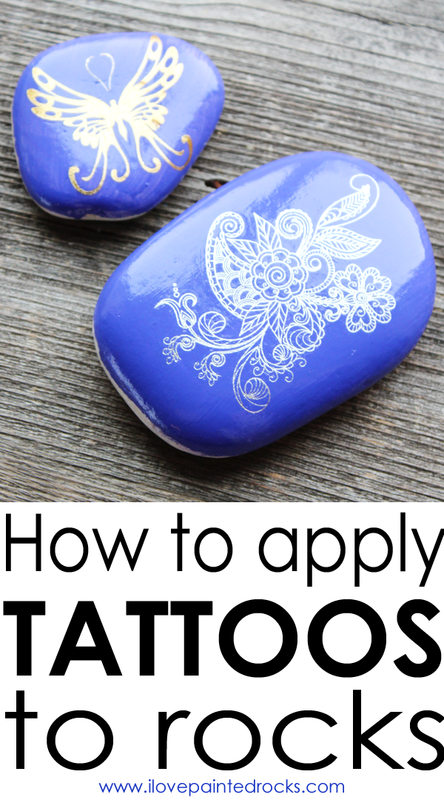 The same tattoos you apply to your skin can be applied to rocks and everyone will be so impressed even if you are a total beginner. This works best with black, white or metallic tattoos. 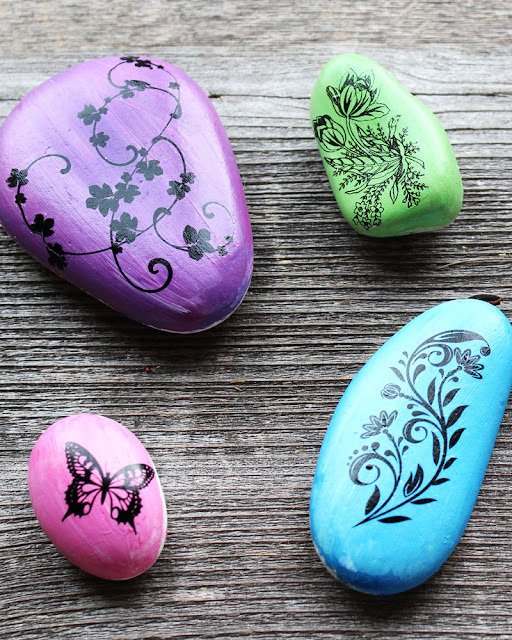 You can apply colored tattoos but they look best when applied to white rocks or rocks that have been painted white first. Paint a clean rock with paint if desired - you can also apply tattoos to naked rocks. Let dry. Peel the clear protective sheet off the tattoo and place face down on the rock. Hold a damp sponge on the back of the tattoo for 30 seconds. Use the sponge to rub the back of the rock until the paper begins to slide. If the paper does not begin to slide after 5-10 seconds of rubbing, hold a damp sponge in place for 30 additional seconds and then rub. Once paper begins to slide, peel paper off the rock. Smooth out design with sponge if needed. Allow to dry. Apply one very smooth coat of Mod Podge. Allow to dry. Apply 1-2 coats of acrylic spray sealer to weather proof them if you would like to place them outside. Here is a sample of what it looks like when you follow the same technique but use plain black tattoos like these. Just follow the same procedure as above! 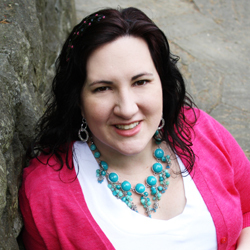 Carissa Bonham is a lifelong crafter and mom of two creative boys. The owner and lead writer of both I Love Painted Rocks and Creative Green Living, she won the Craftys Award for the "Best Craft Blogger" category in 2016. Her projects have been featured in magazines like Kids Crafts 1-2-3, Capper's Farmer and Urban Farm Magazine. Thank you for showing how to make tattoo rocks. I like to paint rocks but wanted to make some special Disney character rocks and I know they would be difficult to paint and have it look decent. I think i will try to use the tattoos to make them. Yours look great! Thanks for stopping by! If your rocks turn out, I'd love to see a picture! Feel free to share on our Facebook page.